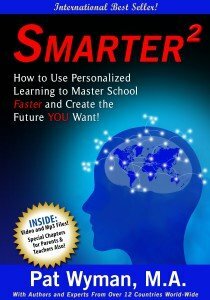 The following is an excerpt from the best-selling book Smarter ² : How to Use Personalized Learning to Master School Faster and Create the Future YOU Want. Here are the Learn to Code for Free Website Resources for you. When you learn to code it is very much the same as learning to learn. Once you know how, it’s like adding a foundational skill such as reading and writing that can be used across all parts of your life. As you learn to code, you are developing strategies for problem solving and becoming an innovator as well. You’re actually forging new territory as you learn to code and it gives you the confidence to turn anything you can imagine into reality. In the process you develop a strong sense of purpose and coding is a unique hallmark of everything personalized learning represents. Imagine what you could develop as a result of knowing how to code. Coding taps into your current beliefs about learning and opens your mind to new ones which ultimately creates new neural pathways leaving you open to the limitless learning discussed in the Introduction for Smarter ². Today, the demand for computer scientists and programmers is outpacing the number of people to fill these jobs. As you personalize your learning and look towards the future, consider learning to code. This is global skill that will open many career doors, including becoming an entrepreneur.